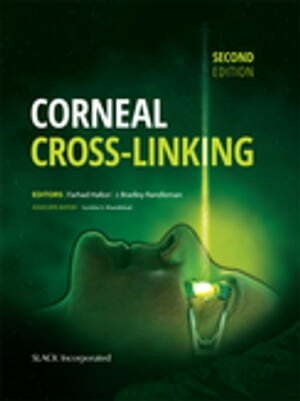 Collins Booksellers - Corneal Cross-Linking, Second Edition by J Bradley Randleman & Farhad Hafezi, 9781630912116. Buy this book online. The new and expanded Second Edition of Corneal Cross-Linking by Drs. Farhad Hafezi and J. Bradley Randleman will provide a concise yet comprehensive summary of the CXL process, including the basic science foundations, treatment protocols and outcomes, recognition and management of potential complications, and modification of standard protocol for special circumstances. Given all the changes in this rapidly progressing field, many brief topics from the first edition have now grown into full chapters or sections. These include expanded sections on alternative treatment protocols, corneal imaging and biomechanics, combing cross-linking with other refractive treatments, and a section devoted specifically to the most highly debated controversies in the field today. With each chapter being fully updated plus including over twenty new chapters that covers the latest advances and future directions, Corneal Cross-Linking, Second Edition represents the cutting-edge of CXL research and clinical practice.